When it comes to making YouTube videos, camcorders are usually not the first choice for creators. And while I’m going to tell you about the many advantages of camcorders below, let’s take a look at why many YouTubers prefer point and shoot cameras or DSLRs. While there are also some cheap camcorders, they can’t compare with cheap point and shoot cameras. If you’re on a very tight budget, affording a decent camcorder might be difficult. While camcorders can give you a decent image quality, they just aren’t up to par with DSLR cameras in the same price range. One reason for that is the size of their image sensor. While DSLRs have very large image sensors, camcorders are usually equipped with smaller ones. The size of the image sensor directly correlates with the quality of the video, and the rule is: the bigger, the better. If you just want to be able to hit record and shoot, camcorders are great. However, if you want more control over your image, they can have quite a few limitations. Some cheaper camcorders have fixed lenses and run mostly on automatic settings. That means you have less control over how your picture looks - from the amount of light that comes through the lens to the white balance. With some camcorders you’ll just have to accept what you get. While camcorders are certainly more portable than DSLRs thanks to their shape and their hand strap, some are relatively heavy (1lb and higher) to carry around the whole day. If you compare them to point and shoot cameras or even phones (which a lot of vloggers use when they’re on the road), they seem less practical due to the extra weight and size. This really depends on the individual model, though. However, camcorders have several advantages over other camera types that can come handy, especially when shooting vlogs. Here are the advantages of shooting with a camcorder. While a DSLR camera typically can’t shoot videos that are longer than 12 minutes, camcorders are able to shoot much longer. Many DSLRs overheat after continuous use and need a break once in a while. Camcorders don’t have this problem. That, combined with the longer recording time, makes camcorders perfect for situations where you don’t want to interrupt the shoot, such as in an interview, a live show, a presentation or another type of live event. An advantage that camcorders have over many point and shoot cameras is that they offer more control during the shoot since they have more control buttons and settings. Camcorders are made to be carried around. They usually have a built-in hand strap, which makes carrying them easier and more comfortable compared to DSLRs. Since they can’t fall off your hand easily, they’re also popular for more action-oriented shooting. When it comes to their onboard microphone, many camcorders offer decent sound. This is especially the case if you compare them with DSLRs, which are known for their subpar sound quality. Of course, using the internal mic of a camera is never the optimal solution. If you want to get your videos to a professional level, make sure you also buy a decent microphone (in case you don’t already own one). Another reason to choose a camcorder over a DSLR is ease of use. While DSLR cameras come with a steep learning curve, most camcorders are ready to use for beginners. Cheap camcorders in particular will come with automatic settings that will do most of the work for you (obviously the problem with that is you have less creative control). If you picture a camcorder in your mind, you’re probably picturing it with a flip screen. That’s because most camcorders have one (although not all of them do). That’s a big advantage over many of the cheaper point and shoot or even DSLR cameras which usually don’t have a flip screen. Flip screens make it much easier to record yourself and to shoot videos from creative angles. As a YouTuber, you probably have different preferences in a camera than the regular hobby filmmaker. Choosing the best camcorder for you will depend on your budget, your experience level and the type of videos you’re shooting. Below, I list some things to keep in mind when you’re shopping for a camcorder for YouTube. How portable you need your camcorder to be depends on what kind of videos you’re creating. Do you sit in a room and talk most of the time and rarely take your camera out? Then you don’t need the most lightweight, mobile camera. ​Do you want to take your camera everywhere you go? Then size, weight and battery life start to play a bigger role. Be aware that the smallest and lightest cameras do not necessarily deliver the best quality. That’s why in most cases you’re going to look for a compromise. Many camcorders on the list below offer great zooms. While a 32x optical zoom can seem impressive, many YouTubers never need to use the zoom function. Particularly if you’re a vlogger, you can get by with a camcorder that doesn’t have a great zoom. In rare cases it can come in handy, though; for example if you want to film animals in nature, concerts and other live shows or pranks. Do you need an external mic input on a camcorder for YouTube or not? I’d say it depends on the audio quality of the camcorder and your goal. While the sound quality of a professional external microphone is always preferable, mics make your camera bigger and heavier. ​If the audio quality of your camcorder is good, you might get by without an external mic. But if the audio sounds a little dull or hollow, you will probably want to switch to an external mic in the long term - it will make your videos much more professional. Note that you can always use an external audio recorder in case your camera doesn’t have an audio input. This will make your shooting process more complicated, though. Manual controls are important if you want to make great quality videos. However, controlling a camera manually isn’t easy and will take some practice and knowledge. ​If you’re a beginner and not sure if you want to put a lot of time into the learning process, buying a more expensive camcorder could be a waste simply because you won’t be able to use all the functions. In this case, a cheaper camera will do. If you want to maximize image quality and are willing to spend some time learning (or are already familiar with cameras), make sure you spend your money on a camera with many manual settings. You’d be surprised how many of the cheap camcorders don’t offer manual focus or white balance. Now, all these things are nice to know, but they’re really generalizations. Many advantages and disadvantages depend on the specific camera - so let’s take a look at some of the most popular options. Canon released its VIXIA HF R700 in three different versions (the HF R70, the HF R72 and the HF R700) in different price categories, which I will describe in more detail below. In order to make this a little easier to write, I will use “HF R700” as synonymous for all versions. The VIXIA HF R700 is the smallest (but not the cheapest) camera in this review. Its small size and lightness make it one of the most portable camcorders out there. While the image isn’t mind-blowing, it certainly is decent, and definitely good enough for most budget-conscious vloggers. And what it lacks in color brilliance it certainly makes up for in picture clarity. 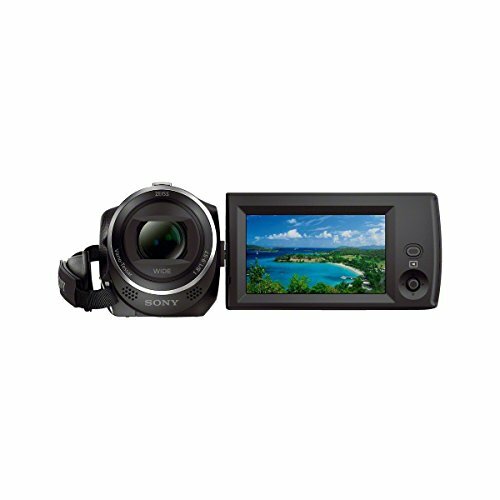 Although the VIXIA HF R700 has a low light mode, its low light capabilities are limited. However, this is true for most camcorders and other cameras in that price range. So you always want to make sure that you have enough light wherever you’re filming. The audio quality of the VIXIA HF R700 is decent and definitely more usable than most (much more expensive!) DSLRs. It is also not hollow-sounding like many point and shoot cameras. The 3.5 mm stereo mini-jack also makes it possible to add an external microphone, which I recommend in the long term. What’s pretty cool about the VIXIA HF R700 is its zoom: No other camera on this list (not even the more expensive ones) offers such a long optical zoom. This is ideal for filming concerts and other live events, nature observations or even pranks. The VIXIA HF R700 doesn’t have a manual focus or aperture. That means you don’t have a lot of creative control over how your image will look. And while that’s cool for most vlogs, you might want to check out another option if you want to film lots of B-roll or if you also want to shoot short films. ​Read more about the technical specifications and features on Amazon. The built-in Wi-Fi and NFC make it easier to transmit the files to your computer or mobile device. The onboard storage is practical but certainly not necessary (except if you want to shoot for many hours). The VIXIA HF R700 is a great cheap camcorder with decent image and audio quality. Due to its long battery life, portability and good audio, it’s a good option for vloggers who don’t need a ton of B-roll. It’s also a great camera for beginners who don’t want to deal with things like aperture and focus pulling. If you need a lot of creative control over your image, you might want to check out other options, though. Like the VIXIA HF R700, the Sony HDRCX405 is one of the more affordable camcorders on the market. The Sony HDRCX405 is the lightest camera in this review list. Even with the battery it only weighs about 7.58 oz. or 215 g. That’s very light! That and the comfortable hand strap will help you carry this camera around for hours. The battery can last up to two hours on Full HD (depending on how you’re using it, though). Just like other cheap camcorders, the Sony HDRCX405 isn’t great in low light settings. You will need to crank up the exposure, which will introduce noise (that’s when the picture becomes grainy). Make sure your room is always lit well when you’re using it. If you checked out the videos above, you will have gotten a good impression of the audio. While it lacks presence in the higher frequencies, it is still clear and is definitely good enough for the “average” vlogger. ​One of the biggest drawbacks of the Sony HDRCX405 is its lack of an audio input. Without an audio input, you’re not able to use an external microphone with the Sony HDCX405. In you want to use one you will need to buy a separate audio recorder, which will make your filming process much less casual. So if you want to upgrade your audio quality at some point, there might be better choices. The Sony HDRCX405 allows you to shoot at 1080/60p. That means you’ll be able to shoot at 60 frames per second in HD. This is especially useful for slow motion or shooting fast-paced action. With the Sony HDRCX405, you’ll be able to record in two different formats simultaneously: AVCHD or XAVC S and MP4. While AVCHD or XAVC S delivers great quality, MP4 is great for instant web upload. The 30x optical zoom and the wide angle Zeiss lens ensure that you can capture anything you need to capture whether it’s close or far away. This is not going to happen to you with the Sony HDRCX405 Handycam: It comes with a built-in USB cable, which means it’s always there when you need it. Of course, that’s not a vital feature but it’s nice to have. Compared to other cheap camcorders, the Sony HDRCX405 offers you a lot of control over your picture: Focus, exposure, and aperture can all be controlled automatically or manually. That’s perfect for shooting a lot of B-roll or even shooting your own short films. ​Read more about the technical specifications and ﻿features ﻿on Amazon. The Sony HDRCX405 Handycam Camcorder is a great budget camcorder that is not only very portable but also delivers good quality footage. 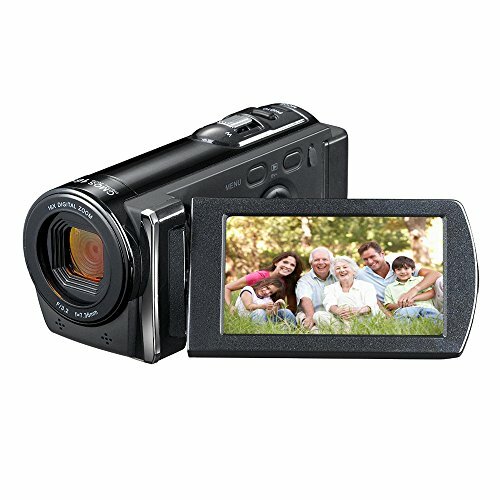 It also offers more control than other camcorders in the same price range. Its biggest drawback is its lack of an external mic input. If you think you want to have better audio quality later, it makes sense to save your money for a different camera. Now we’re getting into the price range where camcorders are competing with DSLRs in value and quality. The Panasonic HC-V770 offers a lot while still weighing less than a pound - 0.778 lb. or 353 g to be exact, making it comfortable to carry around. It might, however, get tiring when you’re carrying it around for the whole day. It is also noticeably bigger than the cheaper cameras on this list. That means you won’t be able to just slip it into a pocket and will probably have to bring a bag with you. The battery lasts up to 1.5 hours, depending on how many features you’re using. In case you want to film a lot of footage, you will probably want to buy some extra batteries. The Panasonic HC-V770 HD Camcorder creates a clear and very sharp image due to its ability to shoot in 1080/60p and its 6.03 effective megapixels on the sensor. This is perfect for any kind of fast-paced action you might want to film like a sports event, a driving car or a running animal. It will also be less blurry when you’re moving the camera fast, which can often happen while vlogging. If you prefer to shoot with a lower frame rate, the Panasonic offers 30p minimum - however that’s only available at 1280 x 720 or lower. So in case you’re looking for a camera with a more traditional camcorder look, you might want to check out the other options. The sound you will get from the Panasonic HC-V770 is full and pleasant. One feature that’s particularly nice is that you’re able to record 5.1 audio (surround sound). Also, if you would rather use a more professional (or different kind of) microphone, you are able to plug that in as well. 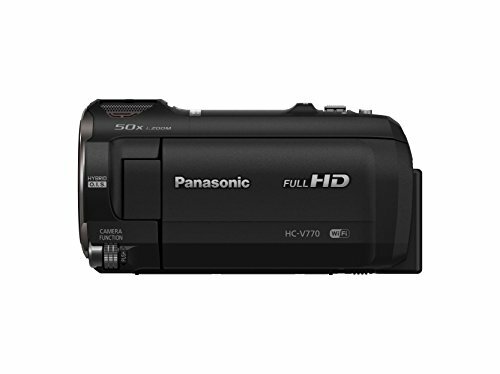 If you like creating slow motion, you will love the Panasonic HC-V770. Not only can it record at 60fps, it can also shoot at 120fps. This is going to make your slow motion scenes much more smooth - or slow. Want to get even more dramatic? The Crystal Engine's Intelligent Frame Creation can interpolate frames to achieve an equivalent of 240fps. When you’re shooting a lot of continuous footage, you often need to adjust settings quickly. Thankfully, the Panasonic HC-V770 is equipped with a convenient manual dial, which controls settings such as focus, white balance, color saturation, brightness and iris. This is perfect for everybody who needs a little more control over the look of their picture. The Panasonic HC-V770 HD Camcorder is a great choice for vloggers who don’t mind the size. The image quality is up to par with many more professional point and shoot cameras, while the sound is full and pleasant. Its crisp 1080/60p look is perfect for fast-paced shots. If you want a more traditional camcorder look, you might want to check out one of the other options, though. 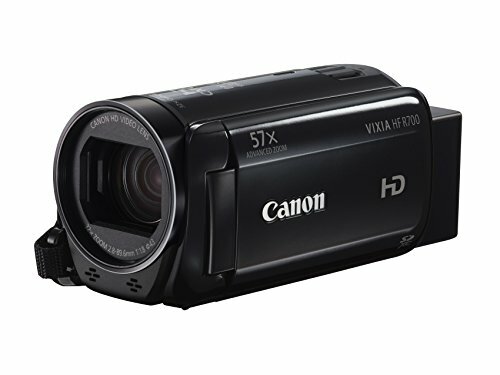 The Canon VIX﻿﻿IA HF G20 HD Camcorder is the most professional camcorder on this list. Although it comes with a heftier price tag, it is used by many YouTubers. Let’s find out why. The VIXIA HF G20 HD Camcorder isn’t just the most professional camcorder on this list, it’s also, unsurprisingly, the biggest and heaviest one. At 1.4 lb. / 620 g it is noticeably heavier than the Panasonic HC-V770 and it’s almost three times as heavy as the Sony HDRCX405. Carrying around almost 1.5 lb. on one hand can get pretty tiring after a while and the size will also make it less convenient. So if you’re going to be a more casual user or need to be super mobile, you might want to check out some of the other options instead. If you take a look at the footage shot with the Canon VIXIA HF G20, you will find that the image quality is impressive for a camcorder (and one that’s much smaller than most prosumer cameras). The increased sensor sensitivity also results in very good performance in low light compared to other cameras in the same price range. When it comes to audio, the Canon VIXIA HF G20 offers a relatively full-bodied, clear sound. Since the picture is so good, though, it becomes more apparent when you’re not using a professional external microphone. So if you decide to buy the Canon VIXIA HF G20, make sure you have some money left for a good mic - at least if you want to get your video to a professional level. The many settings and manual controls of the Canon VIXIA HF G20 will help you get the picture just right. This is great for anyone who wants full creative control over the video. If you’re a camera newbie, though, it means you will likely have to spend some time learning and practicing before you’re able to shoot amazing footage. The HF G20 possesses a special feature that usually only more expensive prosumer cameras have: a focus ring. As soon as you use the ring, it will turn on the focus assist mode, which doubles the magnification of what you’re shooting on the LED screen. This makes it much easier to see what’s in focus and what isn’t. This isn’t even the whole list of features. To see what else the HF G20 can do, check it out on Amazon. 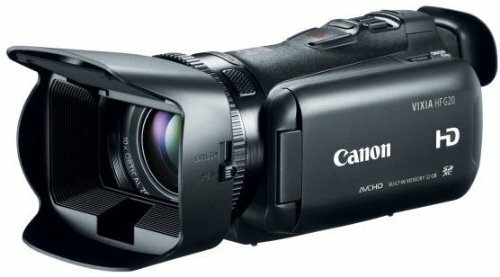 The Canon VIXIA HF G20 HD Camcorder is certainly the most professional camcorder on this list. It offers by far the best image quality and the most control over your picture. The 3.5 inch LED screen with 922k dots and the focus ring help you shoot exactly what you want. The camcorder is also decent in low light conditions, although you might want to check out the G30 or G40 if you’re going to shoot a lot in low light. The Canon VIXIA HF G20 is also heavier and bigger than other low-priced cameras, so depending on what you want to do, that might become inconvenient. The PowerLead Dcam PL-C10 is mostly interesting due to its affordability, which is why I wanted to include it in this review. Let’s see what it has to offer. The PowerLead Dcam PL-C10 is a little bigger than the VIXIA HF R700 and the Sony HDRCX405, while not as big as the Panasonic HC-V770. It is about as heavy as the latter, though. That means while the PowerLead Dcam PL-C10 isn’t the biggest, it’s not super practical for carrying around the whole day (at least not as convenient as the Sony HDRCX405 or a point and shoot camera). For normal vlogging use, this will be totally fine, though. One problem you can see in the video is that its image stabilization isn’t great. A fast pan of the camera makes the image jittery. However, this is a common problem with many cheap point and shoot cameras. That’s why the PL-C10 might be better used standing still on a tripod than for fast-paced action. Yo﻿﻿u can see more test footage directly on Amazon﻿. The audio is probably one of the biggest problems with this camera, though, since audio quality is much more important than picture quality. And while it’s easy to understand speech with it, it’s just not very pleasant-sounding. The PL-C10 offers only digital zoom (no optical zoom), which means that anytime you zoom your picture will become grainy. This is not so bad for most vloggers since zooming isn’t something many YouTubers need. However, it’s important to keep that in mind if you think you want to use it sometimes. Another problem of this camera is the fixed focus lens. This means the focus won’t change whether you’re directly in front of the camera or far away. Since the depth field is fairly shallow, this is not going to be a problem in most distances, but if it ever becomes a problem you can’t change it. One nice feature of the PL-C10 is the built-in LED, which can help you make dark surroundings a little lighter. This is nice for situations where you have no other lighting available. Having said that, other lighting will always be preferable. It’s probably become apparent already that I’m not a big fan of this particular camera. There are too many functions missing and the image and audio quality just aren’t great. If I were you, I would save some money and choose one of the alternatives (or look for a better point and shoot camera in the same price range). However, if you feel like the image and audio quality as well as the provided features are good enough for your purposes, this is a very cheap option for a camcorder.